For the last 4 weeks a dedicated group has gathered on Wednesday afternoons in Parklands to improve their fitness and skills. 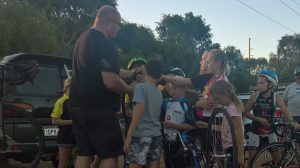 Club Coach Peter Dawson has been heading up these sessions, with lessons focused on group riding, low speed drills, and manoeuvring at speed. 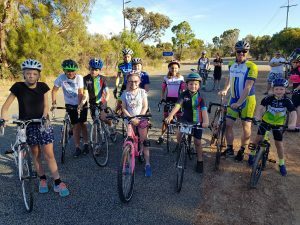 Along with a sprinkling of confidence, this will give the kids the best chance of taking on E Grade when they are ready. Fraser Hanlan and Jordan Dawson have also been working with some teenage members who are already racing. Their sessions are targeting high speed cornering, and interval efforts. Training is also happening before PDCC Summer Criteriums, with a group ride of the race course and a lesson in racing tactics. Wednesday sessions will take a break next week, giving our group a chance to sharpen their skills at home before the next meeting on February 14th. To stay up to date with times and locations be sure to join the PDCC Group Training Rides Facebook group.